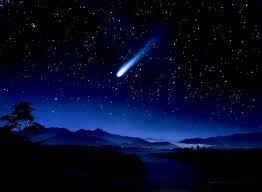 The annual meteor showers are coming up, culminating between August 11th-13th. I have so many fond memories of laying on the ground and staring up to see and count the stars falling over the years, I can't even recollect every one of my stories. With my mom, with my friends, with my daughter... there's something about a vast, unfathomable piece of beauty that just draws people together. You can't stare up at the sky next to someone and watch something so incredible and feel hatred in your heart for anything at the same time. God didn't need to create. He didn't need to create us, or the planets, or the galaxy, or the universe. We weren't some project He set out to do in His spare time. Everything was planned, and created for a purpose. Everyone is unique -- we share traits, but we don't share souls. How you perceive things is singular to who you are, what emotions you're experiencing, what thoughts you're having, and what your past experiences have taught you. For me, laying under the stars is one of the most humbling experiences of a lifetime. It puts my problems into place. In the infinite wisdom of a Designer who created an infinite universe, my tensions and stress are fleeting. Something better is to come. It connects me with people I love, regardless of how far away they might be. "And even though I know how very far apart we are, it helps to think we might be wishing on the same bright star." (--Somewhere Out There from the movie An American Tail.) I remember that they're really not that far, in the grand scheme of things, whether they're alive or dead. I will see them again. It puts me on an even playing field with people I do not like. We're all under the same sky, under the same God, with an equal amount of love flowing from Him to us, whether we are Christian, Muslim, Buddhist, whether we are White, Black, Asian, whether we are Rich, Poor, Middle Class, whether we are Preacher, Teacher, or Murderer. We're not to judge. We're not in charge. We're no better or worse than anyone else under the sky. Find the time to watch the stars this week. You'll be amazed at what occurs to you in the silence, in the dark, in the midst of a moment of incredible, breathtaking beauty.